for residential and professional workshops. Need a new mechanical, engineering, automotive, metal or woodworking workshop garage for your home? Don’t worry about going through the expense of building a traditional workshop with contractor costs and expensive materials and months of work. 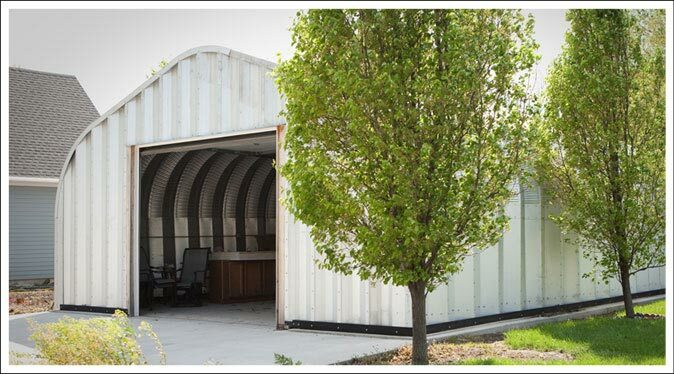 Price out a superior metal garage kit arch building to the exact size you need with an easy to construct prefab metal garage that can be up and ready in just days! With vertical sidewalls the P model metal garage kit and S model metal garage kit arch buildings are perfect for use as workshops such as wood working shops, car restoration or auto body shops or just general workshops for your particular hobbies and needs. The arch building design looks good next to or adjoined to your home. Design your workshop with the desired style access doors and windows, interior lighting, skylights, heating and AC to adapt your space to suit your needs. Choose from a variety of building colors with the superior AkzoNobel Ceram-A-Star® 1050 coating systems to match your home. You will want to lay a foundation before you set up your metal workshop. Other than that all you have to consider is building your interior electrical and plumbing infrastructure if needed. You can also install a heating system or air conditioning system. Most guys use remote systems like window A/C, fans and portable heaters. You can also use different ventilation systems to keep the air fresh inside and extract fumes or dust. Install woodworking and welding tools and machinery, machining stations, paint and prep stations, autobody stalls, mechanic areas and auto lifts in your custom workshop. The metal building is the best interior and exterior structural environment for customizing and developing a home workshop for hobby or professional shop for a business. 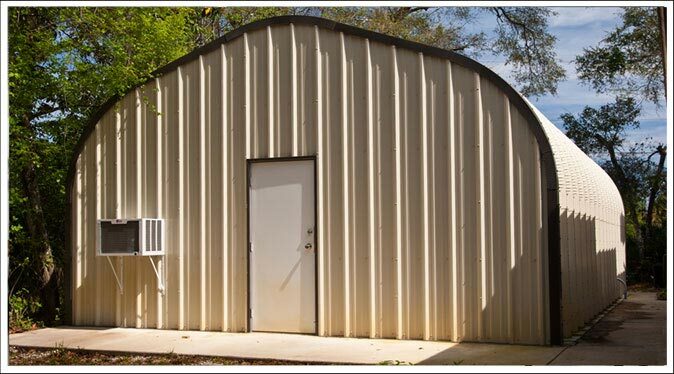 Plan out your workshop space to determine the size of your steel arched building. Typically a home workshop is 20 - 30 feet wide by 20 - 40 feet deep. That can accommodate a car, lawn equipment or RVs and still have plenty of room your your shop. The height is another consideration depending on what you are using your workshop for. If you plan to install a car lift you will need at least 12 - 16 feet. The arch buildings for a typical workshop can can go as high as 20 feet in the P and S model arch buildings. Metal buildings are a much better alternative to wood construction workshops due to their low cost, durability and versatility. With no beams, or rafters you have a 100% usable area inside for your equipment and work benches. You can even add on to your workshop by extending the length as you need more room in the future. The superior certified building construction and design also withstands heavy snow loads, hurricanes and harsh weather conditions. Many of these weather conditions cause normal wood construction to deteriorate, and need additional painting and repairs. Not to worry with your new metal arch building workshop! It is virtually maintenance free and has a 40 year exterior warranty.